"Medical and trauma emergencies are the most likely crisis that you and your family will face in any emergency. If we look at the all the recent catastrophes faced by our great nation one thing stands out as the most experienced event; TRAUMA. It doesn't matter if it’s a chainsaw accident, tornado or a gunshot wound. Life happens and you need to have the right gear. " A firearm is the first object that comes to mind when an EDC or "Every Day Carry" list is mentioned. While I've seen card sized items and flashlights commonly added to most EDC's since then, there's a vital piece missing. We can agree that our EDC, especially our firearm, is to get through an emergency and protect ourselves and others... But what if that does not go as planned? 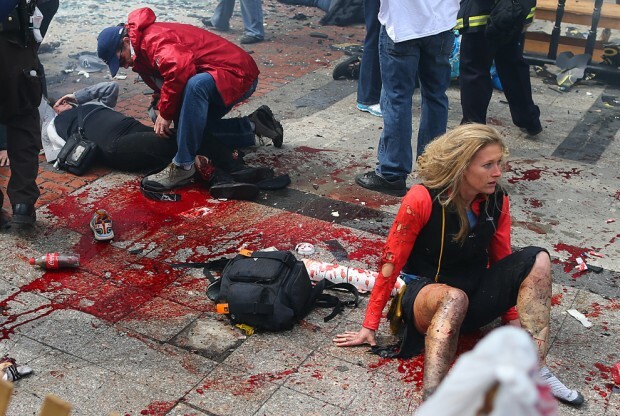 The Boston Bombing: A testament of the effectiveness of tourniquets outside of the battlefield, as well. In a situation where firearms or other weapons involved, the optimal end result is that the threat is taken down, good guy escapes unharmed. Unfortunately, you and I both know that with the nature of ballistics and a high adrenaline moment of stress, that this may not be the case. Even if you have to remove your weapon from the holster, you or your loved one may be harmed in the process eliminating the threat, or you may even have shot a bystander in the process. 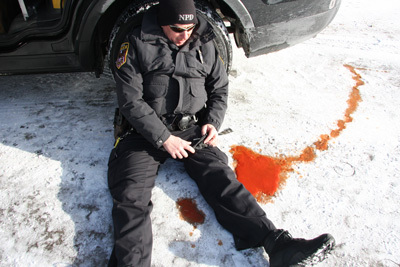 Unless a paramedic is thirty feet away, that person may very well bleed out long before medical attention arrives. That's where your EDC Tourniquet comes along. If you can visualize a hole leaking water from a watering hose as the arterial bleeding and the faucet the hose is attached to as the victim's heart, you can know "Why" you're doing it: the application of the tourniquet is basically you going farther up the hose (artery) to stop water (blood) from coming out. You may waste precious seconds with bandages and direct pressure hoping that fixes the wound. While those methods may be used to slow bleeding, you are going for arterial occlusion meaning the bright red bleeding stops. "Twist, Twist, Twist the Windlass till the bright red bleeding stops." "Where do I put this thing?" The CAT and SOFT-T only seem bulky but with a little folding you can make it's silhouette smaller. Personally, I carry at CAT tourniquet on me everywhere I go, and have at least 2 more in the car at all times. That's not even mentioning my medical supplies. I recommend putting it on your belt, however this is not gospel and your imagination is the limit; You can use pockets, ankle holsters or truly conceal it under a shirt by looping it like a bandolier. 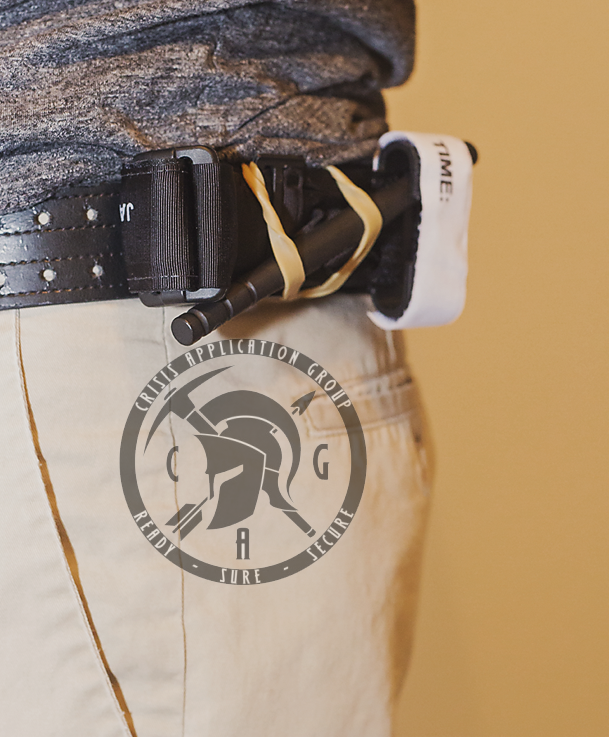 With the belt method, you can loop the tourniquet through the belt as shown, using the velcro to your advantage. If you're worried about a tourniquet attracting attention on a belt, you can pull a shirt or jacket over it, just as with a pistol but with less chance and worry of imprinting. If you can't get it stable enough, try using thick rubber bands to tie it into the belt. If you still can't get it working or need a more durable container for extended wear and abuse, there are a variety of tourniquet holders that are commercially available that are smooth and keep it in good condition. My spouse and i felt relieved Albert could round up his inquiry through the entire ideas he was given from your own weblog. It's not at all simplistic just to always be giving for free steps men and women have been trying to sell. And we do know we've got you to give thanks to for this. All the explanations you have made, the easy website menu, the relationships your site make it possible to foster - it is most astonishing, and it is leading our son in addition to us consider that the theme is thrilling, and that's seriously vital. Thank you for the whole thing! 29-04-2016 Hits:4938 Uncategorized Jay P.